A good way to avoid weed seeds in a surface mulch is by composting leaves. If you receive plenty of leaves in the autumn it is worthwhile composting these separately. 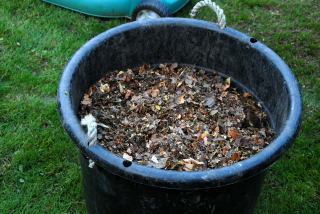 Composting leaves into leaf mould provides an excellent surface mulch. Leaf mould contains no weed seeds. If applied in a thick layer it will also act as a weed suppressant. Weed seeds often need light to germinate. A thick layer of mulch helps to prevent mass germination of weed seeds in the spring. Leaf mould makes and excellent mulch for tree ferns Their natural growing environment is under the forest canopy. Fallen leaves make up a large component of their natural growing medium. The biggest headache when composting leaves is the time involved. Typically leaf mould takes approximately 18 months to mature. Leaves are also initially very bulky. In the small garden it is unlikely you will have the space to dedicate to a double leaf bin as well as a double compost bin. One solution is to use rubbish sacks. Collect up all the leaves. 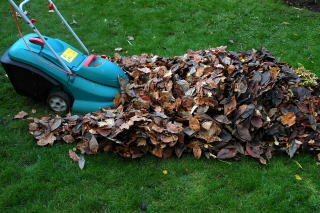 If your garden is large and there are a lot of leaves you my wish to purchase a leaf blower/shredder. For the small/medium garden a rake is sufficient. Domestic electric powered blowers are noisy, awkward to use and take up a lot of room in the shed. Using a rake is better for you and the environment. Pile all the leaves on the lawn. Using a mower with a collecting box, mow the leaves. This will shred and compact them. Make sure the leaves are wet. Fill the rubbish sack with leaves and seal it. Pierce the bags a few times with a garden fork. Wait approximately 18 months checking the composting leaves occasionally for dampness. If you have more space available you can make chicken wire frames for the process of composting leaves. To make the most basic form, hammer four wooden stakes (approximately 1Metre in length) into the ground to form a square then attach the chicken wire to the stakes. (The length of the stakes depends on how many leaves you generally collect). Line the frames with cardboard to prevent the leaves from drying out. Fill the frame with leaves, shredded or other wise and give them a good soaking. Cover with a plastic sheet. Check the composting leaves periodically to ensure they remain damp. The level of sophistication you wish to apply to this project is entirely up to you and your love of basic carpentry. If the leaf fall into your garden is small then you can simply add the leaves to your regular compost heap. One method is to spread the leaves out on the lawn before its final cut. Mow the lawn. This will partially shred the leaves and mix them with the grass clippings creating more favourable conditions for composting. Rake up all your leaves and pile them on the lawn. Shred the leaves using a lawn mower. This can be done twice for an extra fine shred. The shredded leaves can either be bagged up for composting or spread out around the base of your tree ferns or other permanent plants. Another school of thought is to clear lawns and paths of leaves and simply spread them over your borders. The logic behind this is that earth worms will pull the leaves down into the soil and condition it for you. This does work to a certain extent however; the worms that like to eat fallen leaves do not like to live in soil that is regularly dug over. So in the case of the cool tropical garden, leaves should only be spread over parts of the garden where you have permanent plant displays. The parts of the garden which are dug up regularly to plant canna and other tender exotics will not have these worms present. The result will be that you have to rake up these leaves again when it comes to planting out your summer displays. If you wish to observe these worms, head out into the garden on a mild wet night (with a torch) . You will see them stretched out from their burrows like elastic. If you spook them they retreat, again as if they were elastic. Spreading leaves over your borders will also provide areas for winter hibernation for beneficial insects. However what is good for the goose is good for the gander. Slugs also find these conditions appealing and a pleasant way to tough out the winter. You have been warned!